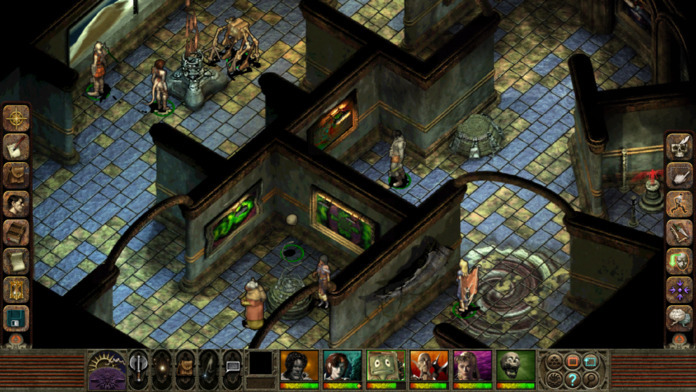 ‘Planescape: Torment’ Review – What Can Change the Nature of an App? Oh. Really? Another one of those old isometric dinosaurs got released on iOS? No. I am sorry, but that’s wrong. THE old isometric dinosaur that devours and spits out other isometric dinosaurs is finally out for iOS. Fresh off solid remasters of Baldur’s Gate ($9.99), Baldur’s Gate II ($9.99), and Icewind Dale ($9.99), Overhaul Games is back with the magnum opus of the CRPG world Planescape: Torment ($9.99), and yes this terrible thunder lizard still has teeth. Much commentary of this recently revamped game is devoted to how the upgrade was handled. As many of you, dear readers, may not be very familiar, I will also be unwrapping my personal experience with the actual content of Torment. Even though I have been an avid gamer through the decades, this was one I did not get the chance to play back in the day (I blame Diablo II, personally). Now given the chance to remedy this grave personal flaw, I present to you my humble take on a giant of the industry. People used to use multiple mods to run Torment on a modern system in an effort to duct tape together the aging in-game systems. It has always boggled my mind the hoops that some people can and will jump through to play a game they love (even if it is self inflicted, like the Dark Souls player below). The Infinity Engine has allowed many of these type of mods to be baked into the core game. Things such as floating combat text and an overhauled UI mean that players spend more time in the game and a little less time fumbling around. For the iPhone version, I have little trouble tapping specific targets on screen, but this feels like a game meant to be played on an iPad. The game sits at a chunky 1.8 gigabytes on my phone’s hard drive which is to be expected of a game that you can sink 50+ hours into. While there are no cloud saves, you do have the option of emailing yourself a backup of a saved game. So it is possible to resume a game on another device, but a bit clunky. Targeting in game is a little rough, especially when going into a zone that is through a doorway of some sort. 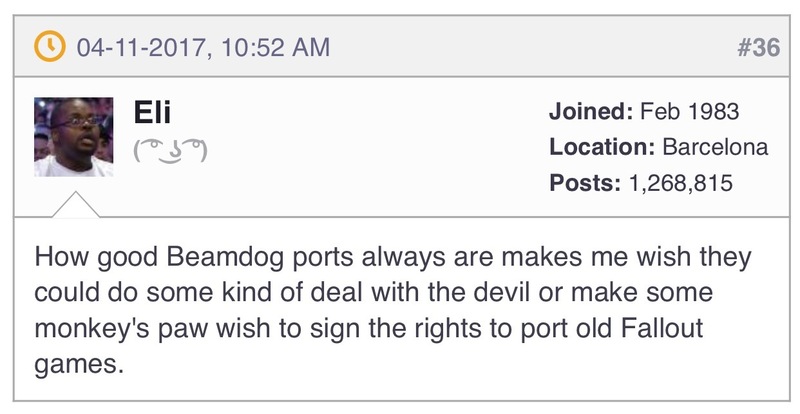 But these quibbles are all within the frame of the idea that this is not just a port but brand new features and bells and whistles all adorn this remastered classic. The overall quality of this pimped out ride is fantastic, a resurrected piece of art. Here’s a quick public service announcement: There is no tutorial for this game. Just like the other Bioware games, you had to dive in and figure things out for yourself in Torment. This game bridges back to the days when you did not have your hand held when digging into a game. For better or worse, you may need to either play through the game multiple times or consult a guide out there to squeeze every drop out of this game. Also, don’t forget we have an active forums community and the Planescape: Torment thread has been a beehive of excited nerds. Feel free to stop by and ask any questions you come across! 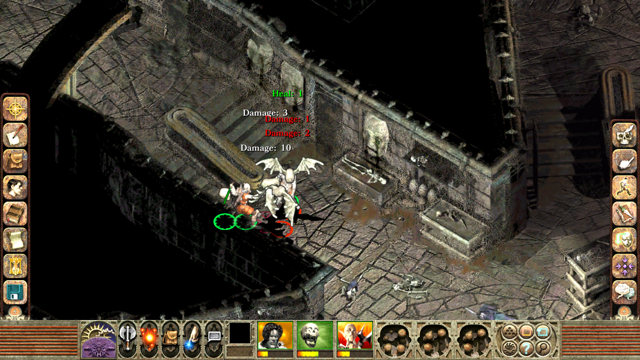 After its original release, Torment earned a cult classic status. For a game that bucked so many traditions, it was very representative of its place in history. The late ’90s was a time of transition into post modernity and the standard sword and board, dwarf and elf, inn and tavern vignettes were old hat. So what was put in place of the beloved time honored staples? Well you wake up as a recently dead (but not all the way dead) person covered in scars but bereft of memories. The city of Sigil, you find out, is an inter-dimensional crossroads that is an odd blend of sci-fi and fantasy with a strong dose of morbid necromantic charm that extends directly to your first travel companion. In lieu of a guide or a romantic companion, the nameless protagonist has a disembodied animated skull named Morte to accompany him. Morte is a great guide in a lot of ways. Just about everything about him points to what you can look forward to while playing the game. He’s chatty, a little bit goofy and a little bit macabre. One mod that did not make it into this version which could have really added a large improvement was a chat accelerator where the intervals between times your companions say something randomly is shortened. The supporting cast is ridiculously well written. About half the time I am more invested in one or more of them than I might be in the protagonist. With these over the top characters (including a mage who has decided that the rest of his life should be spent immolated as a kind of less super heroish human torch), text driven narrative and offbeat underworld vibe, the game is in ways a lot more like a Grim Fandango than a traditional CRPG. The way conversations pan out in Torment is a lot of fun. While yes the sheer amount of text in this game could wither a modern gamebook, the actual content and the actual choices you have are pretty awesome. This was the era just before Knights of the Old Republic and Morrowind, games that really ramped up the trend of open-ended, feelings-driven dialogue. While the chat choices in Planescape: Torment may seem too direct by today’s RPG standards, I really like the feeling that you only have a few ways to play most conversations out and even less of them involve telling the truth or being a lawfully good old chap. Torment allows for a lot of amazing interactions including convincing major plot players that maybe there is a better way to resolve conflict than just 2 sides squaring off in combat. Did I mention the volumes of text this game generates? Because it is a lot. A whole lot. I would warn you that if you are not in the mood to do a lot of reading, maybe don’t fire up Torment. With that said, this RPG is THE RPG you want to play if sinking into a story is your desire. There are very few if any modern games that can hold a candle to the way this game spins a yarn. The story itself is quite an original piece. While many games focus on revenge or conquest, your main quest in Torment is just simply to find out who you were before you died. Along the way, you’re determining for yourself who you are and will be. These two threads spin slowly into the plot to create the full identity of the protagonist. It’s poetic and just like the rest of Torment, a departure from what you expect an RPG to be all about. 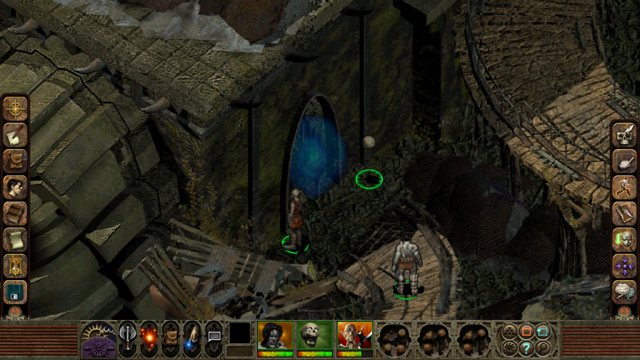 I wish I could say that everything I experienced during my very first play through of Planescape: Torment was exactly what I had hoped, but there are a few things about this game that I do take exception with. Now these things are more about understanding that character creation and the flow of the game are very rarely a “one size fits all" subject so these are quite subjective quibbles, but I digress. Character creation in Dungeons & Dragons type games usually consist of determining stat point allocations, choosing a class and maybe making some background or specialization choices. Now, for the Torment narrative to work, your background is predetermined, but you do get to select stat point allocations. This is actually where the game irritates me. You do NOT get to choose a class and there are only a few classes that you can end up earning. These classes can be unlocked but only if you have the required stat point minimums or else the conversation options with the NPCs that can teach you will never show up. I have no clue why this is the case, and it is slightly vexxing to me that an otherwise great game had this weird flaw in it. As of right now, it is not a huge deal to me and it is a weakness I feel I can suspend my disappointment of and still enjoy the game for what it is. In the past I probably would have written the entire game off for such a strange design decision, but I have changed as a gamer over the years and character class variety and design, while still a high point of many of my favorite games, is less of a deal breaker when it doesn’t go right. I definitely enjoyed the other aspects of the game more than character creation though. Combat, while more simplified, is very similar to other Infinity Engine games like Baldur’s Gate II and Icewind Dale and the only thing I have on my wishlist for that is that human enemies have a nasty habit of running off when they are injured, which usually forces a pause and retarget to keep punching the enemies that are still trying to fight. Graphics are, well of course they are dated, but they are definitely still functional even on my iPhone 6+. The night part of the day/night cycle is a bit too dark but most of the time I try to rest and get back to daylight whenever it starts getting dark (you can also adjust brightness and contrast settings). Controls take a little getting used to as I previously mentioned, but the only time I have problems are when I need to re-target and feel too lazy to pause and make sure I am tapping the right thing. I think most of these can be attributed to the age of the game and for those of us that were gamers back then, they are sins that can be forgiven and forgotten. Bottom line, if you memorize the location of the “skip dialogue" button for every game, you may want to give this one a pass. 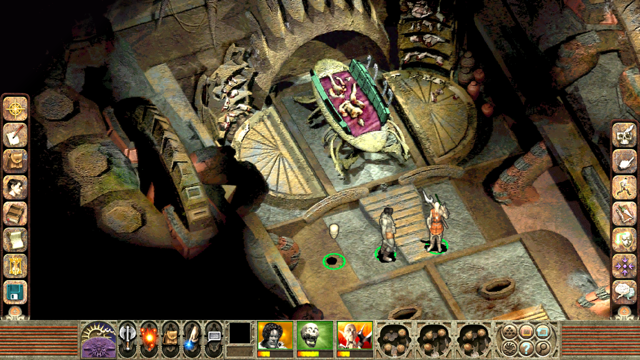 Planescape: Torment still stands tall as a landmark masterpeice that can continue to age gracefully, now on your phone or tablet. Make sure you pack your reading glasses if you grab it!